Classification spectrum for SN2017igf (in black) recorded Saturday night at mag 15.8 with the ALPY 200 just 12 hours after it was discovered by the ASAS-SN survey, which brings my classification total into double figures. It is clearly a type Ia (SNID classification program best match in red) but SNID predicts it to be near maximum from the explosion velocity (calculated from blue shift of the Silicon absorption, taking into account the host redshift) which would mean it has a low absolute luminosity. If it is normal, it should get significantly brighter over the next few days. One to watch ! Well done Robin you are the master of this field. I noticed a clear patch when putting the bin out and got 45 x 5s frames. Here's an image. It does seem bright! Midpoint 21/11/2017 2015 UT. I have got a bit of a routine going now. There are plenty of potential targets at the moment but with no prospect of any clear skies. I just tend to go after them every now and then but I reckon a dedicated setup from a decent site could perhaps bag a hundred or more a year and the ALPY would be a nice instrument to automate. Nice image David. (I had to put the waterproof on to put the bins out tonight over on this side of the country !) Definitely much brighter than on Saturday. If it is a normal Ia and ignoring any extinction in the host galaxy it could theoretically top out around mag 12.8 at this distance. I've just solved the image in Astrometrica. 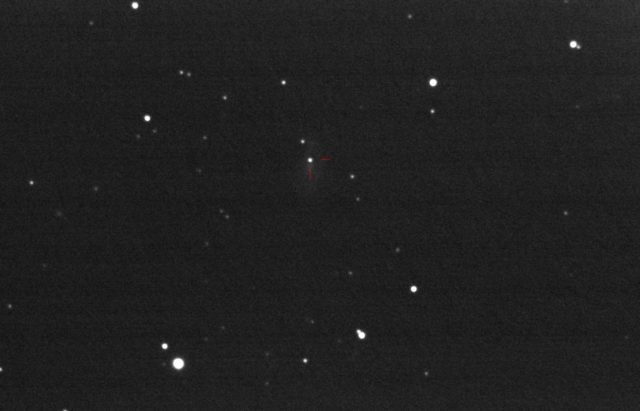 The software also dabbles in photometry: the estimate is 15.1 CV (unfiltered CCD with V mag zeropoint). Indeed, this is first class work Robin. Well done!